A Harvard study indicated that cell phone users are 4 to 5 times more likely to be involved in auto accidents than non-users. The risk for text messaging is probably higher because it requires more attention. lil tv, one of my fairy godchildren- lil tv isn't so little these days! this photo was also taken in 1996 and transferred from film. this was the year when f was living in cleveland while e and I were wrapping things up in connecticut. 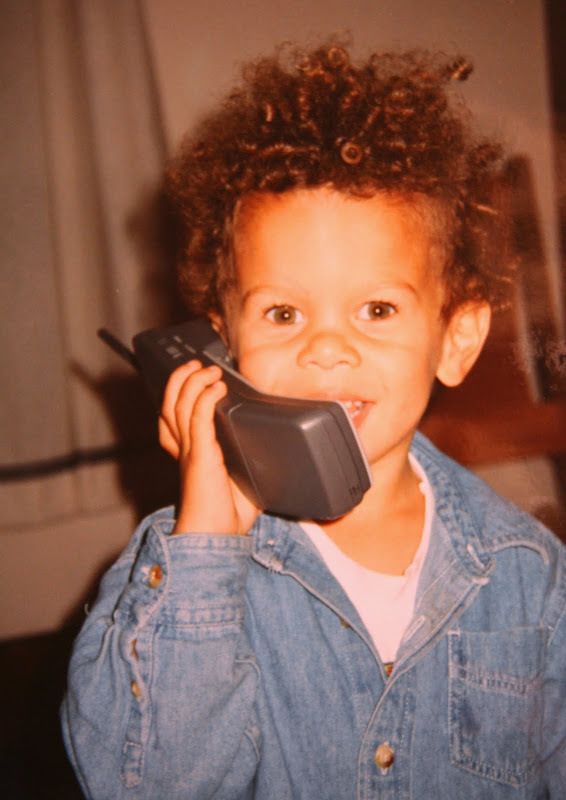 I seem to have taken a lot of pics of people talking on the phone that year - I wonder why! caller id - I love it! 'out of area' = don't have to answer!! 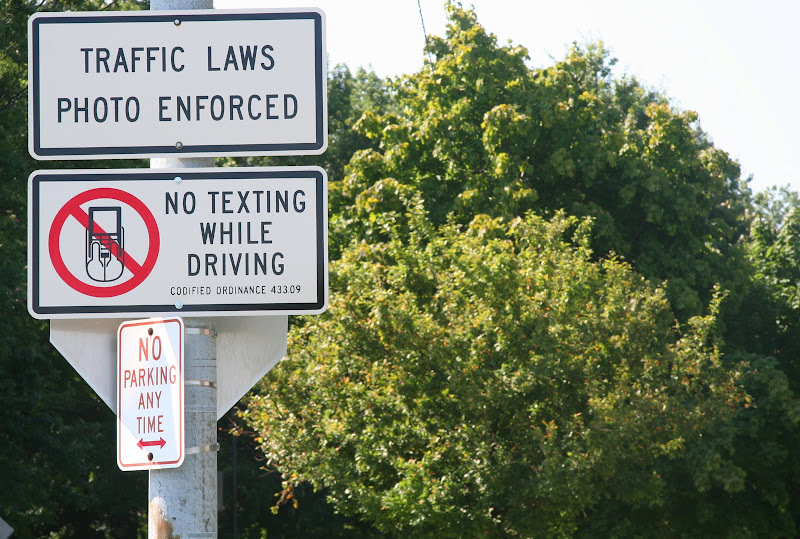 in july cleveland instituted an ordinance prohibiting texting while driving - a most excellent law in my humble opinion. as with alcohol cell phones and driving do not mix!! by the way, this was one of the more challenging themes....I don't know if I pulled it off, but hey, I gave it the ol' college try! blondie's 1980 chart topper call me, the song was also used in the film american gigolo. Yea, you pulled it off-quite well actually. Loved seeing your family with phones. And, Blondie was a great choice of music. Made me smile, made me think - you got up to all kinds of mischief in my head with that post. Brings back the memories of only sending and receiving calls in the confines of ones own home. 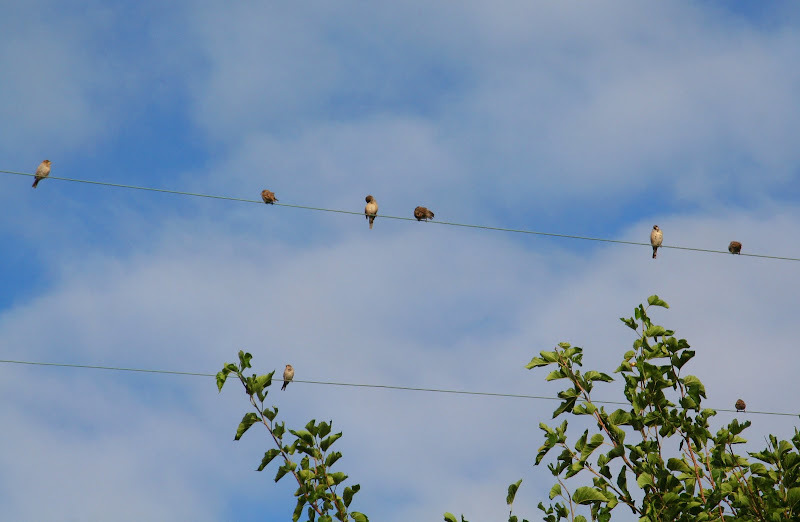 one of these years all the telephones wires will dissapear...poor birdies! they'll have to rely on trees once more. Nice play on the theme. 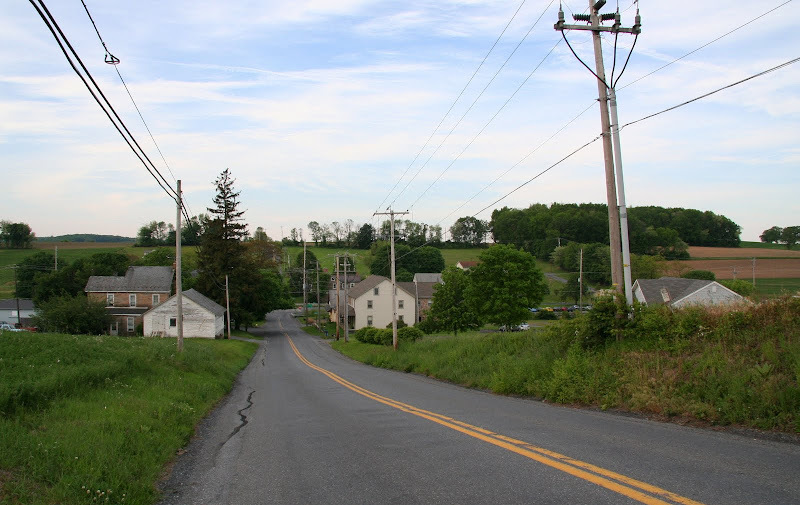 Gosh, I love that country road in Lehigh Co. So quintessentially American. A nice line-up of telephone-related shots! And you picked the same "Call Me" video as I did; I'll have to go back and pick the orchestral one instead! Lovely post,lovely pictures!Yeah I put Blondie too on my blog even though I won't do a TT post today. love the vid! and the nostlgic pics...my boys loved playing with our old cell phones...if i can just keep them from stealing the real ones...no joke, he is in first grade and has several class mates that have their own phone already! I love this. I particularly love the photo of your Nana at 89, and your observation that the image is a rich tapestry of personality, time and place. There is so much to just fall into in that photo, the green desk, the writing implements in the stem glass, the religious artifacts, the candy jar, the tablecloth with stripes perfectly aligned, the walker in front of your Nana, which belies the vigor and engagement on her face, in her posture, as she makes her conversational point. It is such a beautiful moment. My mom and her 6 sisters are up in their eighties and nineties now, so this image for me is so very poignant. Thank you. I don't "text" even when I'm NOT driving. I love the pairing of the Ambrose Bierce quote with the message on the cell phone. Very nice take on the theme..you're always one of my faves! You covered about every base on this one! Great post. And well done for getting that song from the Sainted Leonard in there. Happy TT. I love all the different pictures, it really made me realize how ubiquitous phones are - they seep into all aspects of our lives from cell phones to telephone wires to texting laws and phones are a part of everyone's lives from the old to the young. Such a great post. tom, your remark about the birds mirrored my own thoughts as did kate's remark about the ubiquitous presence of phones.... I fear it won't be long before some company is successful with the concept of implanting small phones - a la the borg - those little ear piece phones are a baby step away from implants! I think you did an excellent job. That picture of your grandma reminded me of mine so much I got a little melancholy - but then the Bierce quote picked me up again! I'd say you pulled it off. Definitely a difficult topic. Well I see we were insync for a couple things! Good selection as usual! The scrabble game is on! I remember that song well. Love your photos adn the storeis behind them. Ahh the phone--can;t live with it, can;t live w/o irt. I love the shot of Nana with the corded landline phone. 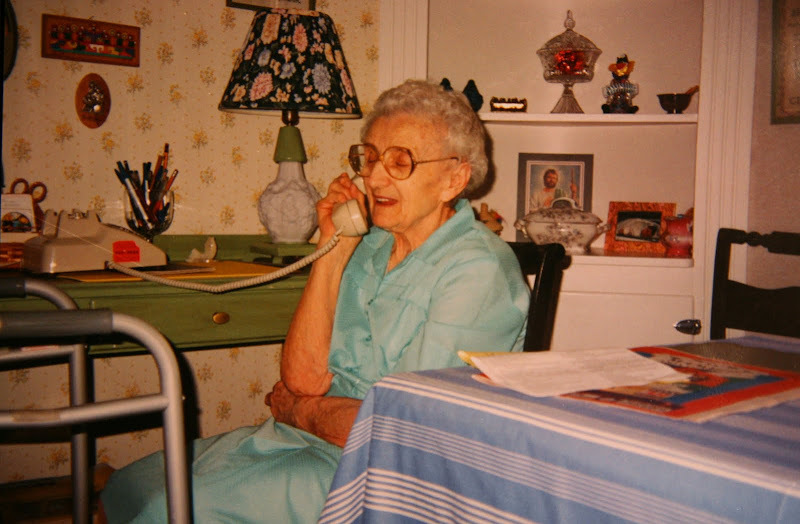 I remember that my Nana had a "telephone station" in her hall with a special little alcove just for the phone.